March 1994. Given this is well into the ‘Wilderness Years’ the previous 12 months have been a boom for Doctor Who with brand new episodes airing on BBC1 (watched by over 13 million viewers) and BBC Radio 5 to mark the thirtieth anniversary. Also, the conclusion of two years of repeats on BBC2, plus substantial documentaries on TV and radio – 30 Years in the TARDIS and Doctor Who: 30 Years. More ominously, and perhaps most representative of the legacy of 1993, there’s been a special edition of The Antiques Roadshow, a reminder that Doctor Who itself was becoming a relic. Before 1993, past Doctors only turned up for repeat seasons, anniversaries or one-offs; afterwards they were ever present. 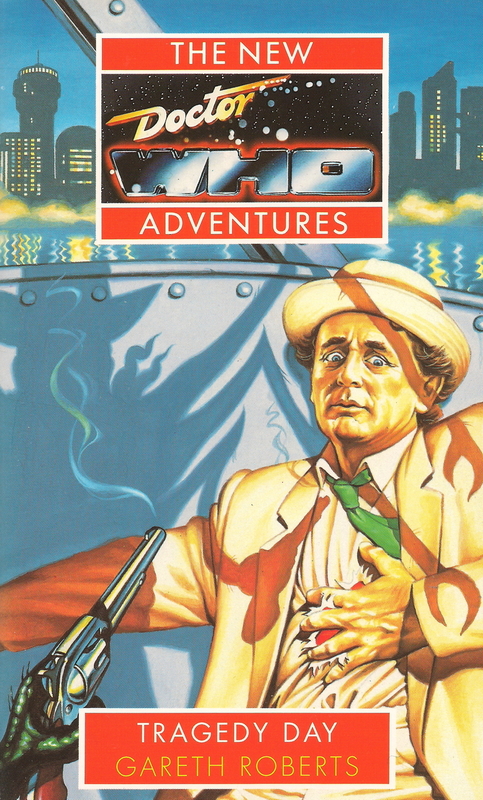 Launching in July 1994, Virgin’s Missing Adventures set the precedent for an ongoing series of ‘Past Doctor Adventures’ that was continued by BBC Books in 1997, and ultimately by Big Finish since 1999. Arguably, the subsequent dilution of writing talent across multiple ranges was damaging to overall quality in the long run, but the immediate impact seems to have been a change in direction, and an upping of the game, for the New Adventures. After all, it wouldn’t do for the past to overshadow the present, or the future. That said, there were casualties: the biggest loss being Gareth Roberts, whose Tragedy Day is practically a soft re-launch for the New Adventures, and who, with a single exception, now departs the main range for the Missing Adventures. As one of the regular writers of the 2005 revival, Roberts’ novels are particularly interesting because they show the evolution of his writing style. What’s fascinating is that even in 1994, after only one previous book (1993’s The Highest Science) he’s already been pegged as ‘the funny one’, a tag he still carries in 2015. The Unicorn and the Wasp is the ‘comedy’ episode that breaks up what could otherwise be a pretty grim fourth series; The Lodger and Closing Time are light-hearted interludes before their respective season finales. So, Roberts is the man you bring in when you need to lighten the tone. And in March 1994, the tone of the New Adventures definitely needed lightening. Since the War Ace arrived in Deceit, the seventh Doctor’s TARDIS crew has been at each others’ throats: mistrustful and angry. One of the undercurrents in the ‘alternate history’ cycle is the team falling apart, losing faith in each other and generally having a pretty miserable time. This was directly addressed and apparently resolved in the previous novel, Paul Cornell’s No Future – but given Doctor Who’s past form at actually paying off resolutions (cf. The Armageddon Factor; The Trial of a Time Lord), readers might have been forgiven for thinking ‘gritty’ and ‘grim’ were going to be the constant watchwords for the New Adventures. Which means it’s a genuine pleasure when Tragedy Day turns out to be a sprawling, messy satire that pokes fun at practically every aspect of 1990s life (because its setting, the planet Olleril, is a cultural echo of Twentieth Century Earth). Roberts’ most popular novels, his fourth Doctor and second Romana Missing Adventures, explicitly align themselves to Douglas Adams’ Doctor Who, but Tragedy Day is unmistakeably cut from the same cloth, with the same mix of absurd bathos, ridiculous juxtapositions (Ernie the arachnid assassin, the Celebroids, and monsters called the Slaags) and deliberate damp squib revelations that only highlight the pathetic pretentions of galactic dictators. Best of all, Tragedy Day was genuinely a new start for the New Adventures. With Rebecca Levene gradually taking over editorial duties from Peter Darvill-Evans, the books became generally less uptight. They could ‘keep the flame burning’ without having to aggressively shun the past. Later in 1994, readers got sequels to both The Monster of Peladon and State of Decay, and the return of the Master. Drama wasn’t generated by the antagonism between Ace, Bernice and the Doctor, but by external menaces. It’s not surprising that this is by and large the books’ most fondly remembered ‘era’ – the one Big Finish revisited in The Shadow of the Scourge, and DWM chose to celebrate (and poke fun at) in their New Adventures tenth anniversary comic strip The Last Word (written by Gareth Roberts). The New Adventures’ ability to gracefully and convincingly reinvent themselves in 1994 – before Darvill-Evans’ approach had run out of steam – shows they were genuinely worthy successors to the TV series. When BBC Books tried to pull off the same trick in 1999, in response to competition from Big Finish, the Eighth Doctor Adventures floundered and never regained their momentum. Conversely, the New Adventures went from strength to strength, producing, in 1995, one of the all-time classic Doctor Who stories.